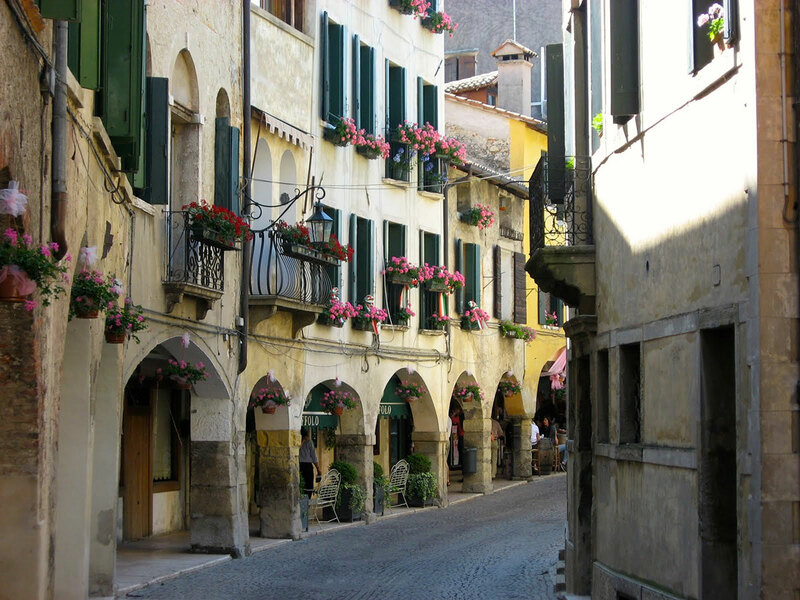 Rewarded as one of the most beautiful hamlets in Italy, Asolo is a charming medieval hamlet. It is surrounded by the Asolan Hills and constellated by portico streets and sumptuous noble dwellings. Its story is indissolubly fond of three women: the queen Caterina Cornaro, who built a literary and artistic circle in her castle, Eleonora Duse, a famous actress, who is buried here and chose it as the place of her retirement and then Freya Stark an enthusiastic English traveler and writer. Asolo became so popular among English-speaking writer that many of them moved there during the 19th century to find inspiration for their works. Coming to Asolo from the plain, you can already see the imposing size of the queen Cornaro caste and of the Rocca, an ancient fortress, which is its symbol and the first settlement of the city. It does not matter from which street you reach Asolo. You’ll get to the beautiful Piazza Garibaldi, the main square of the hamlet, recognizable from the charming Fontana Maggiore and the cathedral. Asolo was renamed “the city of hundred horizons” by the writer Giosuè Carducci because of the numerous suggestive panoramas on the landscape that you can enjoy from there. Its magical atmosphere makes Asolo a right place to have a rest or a relaxing walk.